The refurbished Late 2013 Retina DG Macbook Pro is a very special Macbook Pro  this is a Retina DG Macbook Pro, which means it has a Dual Graphics processor for professional-level workstation performance. The 15-inch Retina DG Macbook Pro is specially designed for the fastest possible performance when working with images and HD video. And as a game platform, you simply cant do better! GainSaver is the best place to purchase your refurbished Late 2013 Retina DG Macbook Pro. GainSaver can even configure your discount Retina DG Macbook Pro with more memory and a bigger hard drive for even more spectacular performance. And you get the lowest prices and a 30 Day Money Back Guarantee when you shop GainSaver! The Retina display on the used and refurbished Late 2013 Macbook Pro is an amazing thing to see. 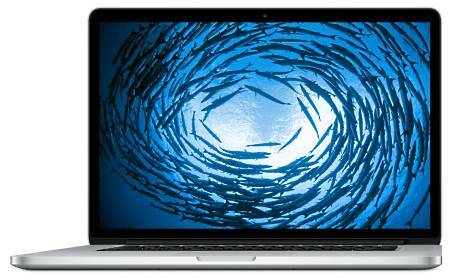 At 2880 x 1800 resolution, there are over 5 million pixels packed into the 15-inch Retina DG Macbook Pro display. They are so small and tightly spaced that you cannot distinguish individual pixels. Its almost like looking at your text documents on a printed page. And your images are incredibly sharp and vibrant. In addition, the used Retina DG Macbook Pro incorporates IPS technology which gives you a wide viewing angle of up to 178 degrees. That means you can show off your work to everyone standing around you, and they can all get a beautiful view with no loss of color and contrast. The Retina DG Macbook Pro, with its dual graphics processors, is extremely powerful and extremely popular with designers, video creators, web developers, audio engineers and scientists. The additional graphics card that is built into the refurbished Retina DG Macbook Pro is a high performance NVIDIA GeForce GT 750M with 2 GB of dedicated memory. The refurbished Retina DG Macbook Pro is the one you want for doing professional image manipulation, video production, software development, scientific modeling and other demanding image and video projects. When the GeForce GT750 graphics processor is not needed, the Intel Iris 5200 graphics processor takes over to save power demands on the battery. The discount Retina DG Macbook Pro has anther nice feature youll love  a blazing fast Wi-Fi connection. It uses the 802.11.ac Wi-Fi standard, so you get almost 3x the data transfer rate of the previous 802.11n standard. Youll enjoy super fast file transfers and movies that download in a surprisingly short time. With faster Wi-Fi, taking your Retina DG Macbook Pro with you wont slow you down. This is a refurbished Late 2013 Retina DG Macbook Pro  it has a second graphics processor built in that makes this machine really fly! Its a high performance Macbook Pro designed for serious work and play. And when you shop from GainSaver, you can easily make it even more powerful by adding additional memory and hard drive capacity. If you plan to do video production or audio recording, add a bigger hard drive! You will never regret having more file space. And with additional memory, youll be able to process more data faster. Just select the options you want for the GainSaver Configurator. When youre satisfied with your selections, just click the Buy Now button to place your order.